This is a mapmaking competition entry from Nick Pelletier. Many years ago, a monastery to the goddess Lacodor was established alongside the wide river of Gragmoor, in an isolated part of an ancient kingdom. Across the river, to the North, a quarry was dug out of the hillside to provide stone for the monastery construction. After a few years, the farms, fields, gardens and orchards of the monastery began producing quite well and attracted the attention of others. The location of the monastery became a destination not only for pilgrimages to Lacador, but also for traders and merchants. By royal order, a bridge was built and a substantial trade route formed crossing the river towards the city of Meir far to the North and many small farming villages along the river. Soon after the bridge was completed, a zealous monk saw corruption of the monastic life in the form of so much trade and commerce. He climbed to the top of the quarry face, cursed the land and the stones before leaping to his death upon the open quarry. Since that day, not a single stone has been removed for fear of invoking the curse. The curse caused the monk and many others to rise from the dead and wander the hillside shrieking and howling after sunset. Over the years, the hillside has grown over and the trees have reclaimed it to the point where it can barely be told that a once-profitable stone quarry ever existed here. For decades later, the horrible death-screams of the cursed monk resonated over the hills causing it to be given the name “Banshee’s Peak.” Recently, an adventurous group has successfully rid the hillsides of the unholy creations but still, no one is willing to tempt fate by removing any stone. The town of Gragmoor Quarry was established soon after the Gragmoor Bridge was completed and is ruled by Count Olaf. Count Olaf is a well-meaning lord who was granted ownership of the lands to the east of Gragmoor River by His Majesty, the King. Initially, there were some misunderstandings that lead a young Count Olaf to believe that all the lands around the river now belonged to him. This lead to a great deal of animosity between the monks of Lacador and the young Count. Count Olaf was preparing to march his soldiers on the monastery to take his rights by force when the Royal Prince arrived in time to mediate an agreement between everyone. West of Gragmoor River remained in the control of the monastery while east of the river was for Count Olaf. Gold Tower Inn – Far to the North lays the foreign city of Meir and the fabled Golden Towers, many days travel away. Gold Tower Inn was established by a family from Meir who moved to take advantage of the growing opportunity of Gragmoor Quarry. Strong in Meir culture, style and food, Gold Tower Inn provides a taste of home to those visiting from Meir and an exotic change of pace to others. Temple of Lacador – A provision Count Olaf provided to the monks was to build a temple to Lacador within his city. Though this was staffed by acolytes and priests of the church, the monks were granted rights and privileges via the temple while in the town. Most of which meant market space for their goods. Monastery of Lacador – Home to the monks of Lacador. The original construction in the area. Also the source of most local farm goods in town. Ol’ Tom’s Farm – One of the first permanent structures after the Monastery. Ol’ Tom built his farm to support construction of the bridge across Gragmoor River. Known for his brewing abilities, Ol’ Tom became quite successful as a brewer. Though the farming is almost non-existent anymore, his descendants still run the brewery located here. Count Olaf’s Residence – Olaf was granted lordship of the area of Gragmoor Quarry upon completion of the bridge. He was granted rights to the East of the river as the West was still under grant to the Monastery. Docks – River traffic from the Southeast increased with the creation of the bridge, as well as the notoriety of the Lacador monastery produce as well as Ol’ Tom’s brewery. Grant’s Inn – Count Olaf tried to refute the monastic grant when his own grant was given. An armed conflict between the two was narrowly averted when His Royal Highness, Prince of the Realm arrived. On the site of this inn, a peace agreement formalizing the Gragmoor River to be the boundary was signed. Soon after, the inn was built on the spot. The common room has a large, flat boulder that the Grant Agreement was signed on. The Inn was built around it. Gragmoor Bridge – The last stone structure built from the quarry. This sturdy bridge was built to facilitate trade to the North. It has secured guardhouses at both ends manned by the Sheriff’s deputies as well as Count Olaf’s soldiers. Sheriff’s Quarters – Home and offices of the Sheriff of Gragmoor Quarry. Small gaol is located here as well. The Sheriff is appointed by Count Olaf to maintain order. Market Square – Main meeting place for the townsfolk of Gragmoor Quarry. Daily market stalls are set up here selling goods from traveling merchants arriving by boat from the southeast or northwest, by caravan from the North, the monastery monks, surrounding distant farming villages to the Northwest, Southeast and North. Though a small town, this market is very well supplied, providing most goods needed for the townsfolk and Count Olaf’s men. Another excellent work. Where can I see more of your stuff? 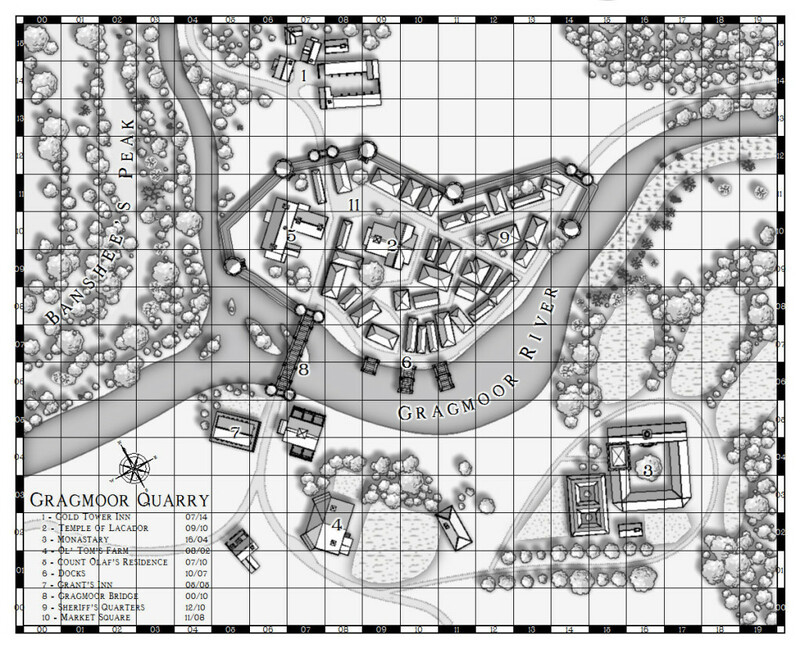 I always love these black and white CD3 maps…kind of old school but with modern flair. Plus, this one is well laid out. This map is excellent and a great example of what can be done with a rather restrictive tool if you take the time to learn the capabilities. My only gripe is the grid. Why? If you took it off, this one would go in my inspiration folder. What can I say, after I all I designed the underlying style. 🙂 Nice and clean work, the layout of the town is interesting and the map communicates it clearly. Stylish and the layout is very convincing. Perfect example of a functional map, and it proves that maps without all the ‘arty-stuff’ can look great. Thanks for the great comments! At first, I wasn’t too fond of the black and white style. Now after doing a few maps, it’s become my favorite! I’ve linked my photobucket album to this post for those who asked about other examples of my maps. A good map that has everything I expect: organic looking village structure, legend, compass. Easy to read, good layout. I expect some good maps from Mr. Pelletier in the future. This is a nice clean map – very easy to read. A few things niggled that could do with being tweaked – the grid interfered with the legend text, and the surrounding numbers in the border don’t quite fit in or out. Fixing those would bring the map on another step. Also, for a map of a quarry I couldn’t find the quarry on the map or on the legend! If it’s off the map (as I assume it is) then an arrow would be great. I was also a little surprised to see walls around some of the town, but not all. Invaders just need to get into the river at the docks and they’re in. Those are really small notes – it’s a great map that clearly lays out an interesting location. I could pick this up and use this in a game with no trouble at all. Well done. The Quarry is the hill side across the small river from town. It had been cursed and trees have since ‘reclaimed’ the quarry. I was trying to get across a terraced look to the hill since it would have been carved that way when it was an active quarry but has since become overgrown.